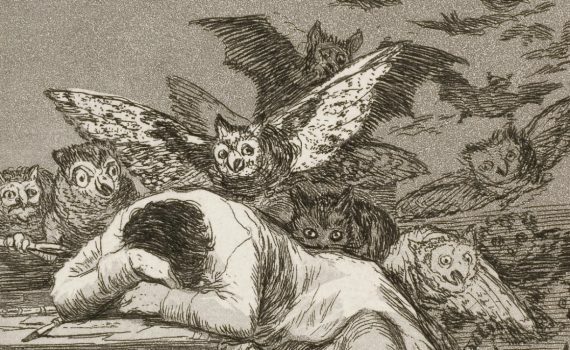 Goya depicted the demons that arise when reason sleeps. Goya depicts the king’s family in scintillating detail… but the sparkle of the monarchy is beginning to fade. Goya’s taste in home décor is called into question by this cannibalistic meditation on the nature of power. This print wasn’t made public until long after Goya’s death, for fear of exposing his controversial political views. Embodied by a swarm of airborne predators, the follies of an irrational society haunt an artist’s dreams.